In between cutting my feet and eating, we managed to visit two museums. The Split City Museum wasn’t too bad and we got in for free as we had the Split Card. As we entered, I heard music playing from the distance. As we gradually made our way up to the second floor, we found a mini 10-piece orchestra rehearsing. It felt like we were walking through a magical kingdom with an amazing soundtrack. The second was by far my favourite. It was the Split Modern Art Gallery or Galerija: Umjetnina. We got in at a discounted rate with our student cards (always ask for a student discount because you save so much money). Tickets are priced at different rates, where one ticket includes entry to the temporary exhibit and the other only to the permanent show. The works in there were breathtaking, especially the temporary exhibit titled Phlogiston. Man on fire as part of Phlogiston. Probably the most overwhelming piece in the gallery. At night, Split never sleeps, very much like its older and more cultured sibling, Zagreb. Walking around at 10pm, the streets are still filled with music from street performers and free concerts. The clubs don’t even fill up till 12am, when the night really starts. Isn’t the Bell Tower absolutely stunning? Female a capella group were absolutely amazing. On our last night in Split, before jumping on a 7 hour night bus, we walked through the busiest evening yet. Many locals were out and about that night as there was a football match happening between the local Split FC called Hajduk (pronounced Haidook) and Prague’s FC. The atmosphere was joyous as always, with many people half drunk by 7pm. 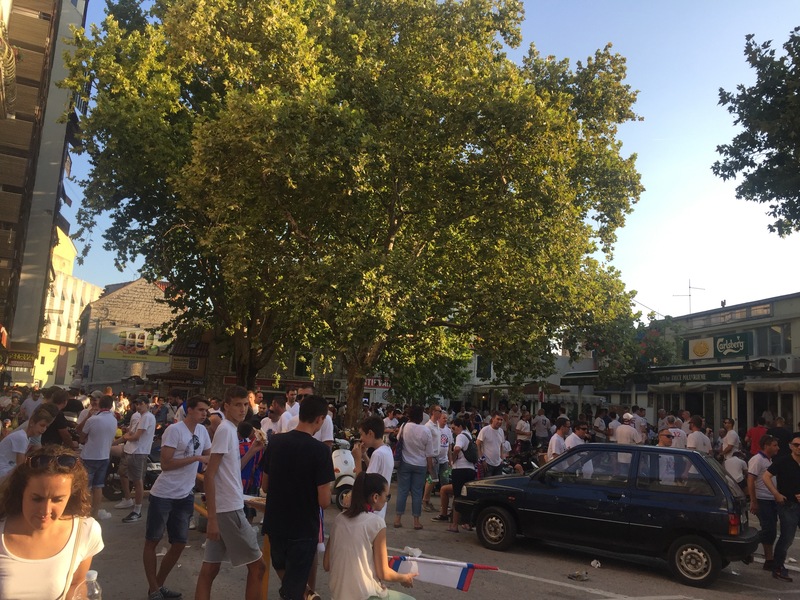 Drivers honked as passengers stuck their bodies out of the windows and waved Hajduk flags around town.